Academician Nikolay Nikolaevich Vorozhtsov Jr. (1907-1979) is among the Russian school of specialists in organic chemistry who have laid the groundwork for chemistry and technology of organic compounds in our country. 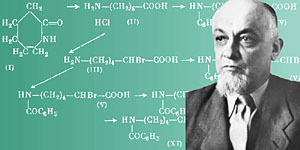 The main direction of scientific works of N.N.Vorozhtsov Jr. was the development of theoretical, synthetic, and applied fields of chemistry of aromatic compounds. The widespread acceptance of tracer technique and alternative physicochemical research methods has allowed him to reveal the general features of displacement of various substituents in aromatic nuclei, to recognize the mechanisms of isomerization reactions, and to understand the role played by various acid catalysts that are used when carrying out the similar reactions. N.N.Vorozhtsov Jr. discovered a series of new reactions of isomerization of aromatic compounds, and some of them were of industrial interest, for example, conversion of alpha-naphthalene chloride to beta-isomer on alumooxide catalysts. N.N.Vorozhtsov Jr. has performed an interesting research in the field of reactions of nucleophilic substitution in aromatic series. The widespread acceptance of kinetic methods made it possible to receive new evidence on the mechanism of nucleophilic substitution of halogens, of sulfuric and nitro group. Based on these works, optimum conditions have been found for the industrial production of certain important products, to take an example, p-nitroaniline and naphthols. Last period of his life, N.N.Vorozhtsov Jr. fruitfully develops chemistry of fluoroaromatic compounds. He worked out an original method for preparation of aromatic fluorochemicals by way of chlorine atoms exchanged for fluorine through the action of fluorides of alkali metals. This way has made it possible to obtain such promising and previously inaccessible compounds as phenyl hexafluoride, octafluoronaphthalene, tetrafluorophthalic acids, etc. and it has been commercially realized. He has investigated exchange reactions of fluorine atoms in polyfluoroaromatic compounds for nitrogen, oxygen, and sulfur-containing substituents and has developed the ways of synthesis of fluorinated heterogeneous ring compounds. A great work has been done by N.N.Vorozhtsov Jr. in the organization of the Novosibirsk institute of organic chemistry. Having made a skeleton of scientific personnel from graduates of sub-faculty of the Mendeleev institute, N.N.Vorozhtsov Jr. moved to the being constructed Novosibirsk Akademgorodok in 1958 and devoted the last 20 years of his life to develop chemical science and industry in Siberia. Under his guide and with his direct involvement, the basic scientific directions of the work of the Institute have been shaped. N.N.Vorozhtsov has been directly involved in the creation of Novosibirsk state university; he was the organizer and the first head of the organic chemistry sub-faculty. N.N.Vorozhtsov Jr. has created the school that is not only developing now the basic research in the field of chemistry of aromatic and heterogeneous ring compounds, chemistry of renewable vegetative raw material, but is also solving great applied problems. Under direction of N.N.Vorozhtsov Jr., the technology has been developed and put into commercial production for certain chemicals that are important for the national economy: meta-diethyltoluamide used as an insect repellant; 4,4 '-diaminodiphenyl ether that is the initial product for thermally sound polymers; phenyl hexafluoride as a basic fluorine-containing product, etc. Tens of candidates of sciences and full members of the Russian academy of sciences: V.A.Koptyug, D.G.Knorre, L.S.Sandakhchiev, and V.P.Mamaev, corresponding member of the USSR AS, rank among the disciples and followers of N.N.Vorozhtsov Jr. His disciples who keep cherished memory of him are developing many ideas of N.N.Vorozhtsov Jr.
* Source: Vlasov V.M. Akadyemik AN SSSR N.N.Vorozhtsov-ml. 1907-1979 // ZHurn. organichyeskoi khimii. - 1997. - T.33, N 5. - S.645-646. 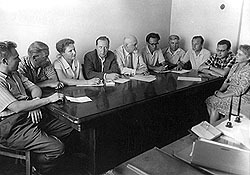 The first session of the Scientific Council of the NIOKH SB AS USSR in the premises of the Hydrodynamics Institute in summer, 1960. Left to right: Bukharov V.G., Koptyug V.A., Kozachok L.K., Livanov V.A., Vorozhtsov N.N., Mamayev V.P., Troscyenko A.G., Fokin YE.P., YAkobson G.G., Pyentyegova V.A. Dokumyent izmyenyen: Wed Feb 27 14:46:54 2019. Razmyer: 10,415 bytes.